The start of the race did not lack for drama, as immediately when the lights went out Evans pulled up lame, victim of a broken driveshaft. He was quick to use his remaining momentum to clear to one side but the cars behind were forced into rapid avoidance mode, resembling the start of an F2 race, prior to the rolling start they've adopted to solve their clutch issues. Coming into the first turn (Turn 6 on the circuit as the start line and finish were in different spots) Jose Maria Lopez of Dragon cut sharply to the inside, destroying his unspotted teammate Jerome D'Ambrosio's front wing along with his own rear wing and littering the track with debris, earning them both the black and orange flag the following lap. At the front, Daniel Abt wasted no time, dispatching Prost for P2 immediately and it wasn't much longer before Nelson Piquet Jr., did the same. By the third lap, Bird, working his way through the midfield had doggedly made it into the points, while at the back of the field, Lotterer and Vergne seemed content to take their time before attempting forward progress, saving energy early on to take on the attack later. No such concerns at Audi as by lap 6 Abt had carved his way by Buemi and was receding into the distance, the Renault powertrain lacking that ultimate efficiency of their German competitors this season. 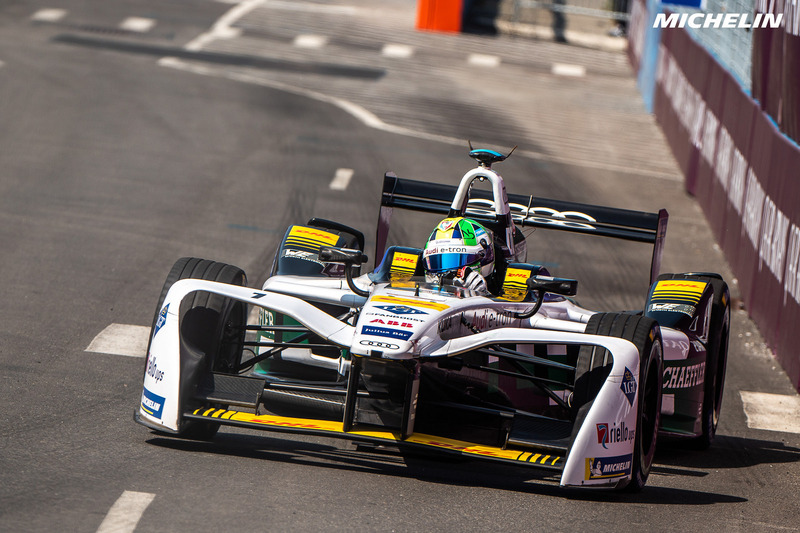 Behind, Lucas di Grassi was clearly on a mission, setting fast lap with the gleam of P1 on the horizon. At this point in the race as well, the Techeetah team was on the move, Vergne trailing Lotterer, who had been assigned the task of carving a path through the midfield and catching Sam Bird as quickly as possible, allowing the championship leader and his teammate to save extra energy. P14 for Vergne as they started round for the 7th time as up at the front, the previously unheralded Tom Dillman, filling in at Venturi, made everyone sit up and take notice, as he stuck it to Piquet Jr., for P3. 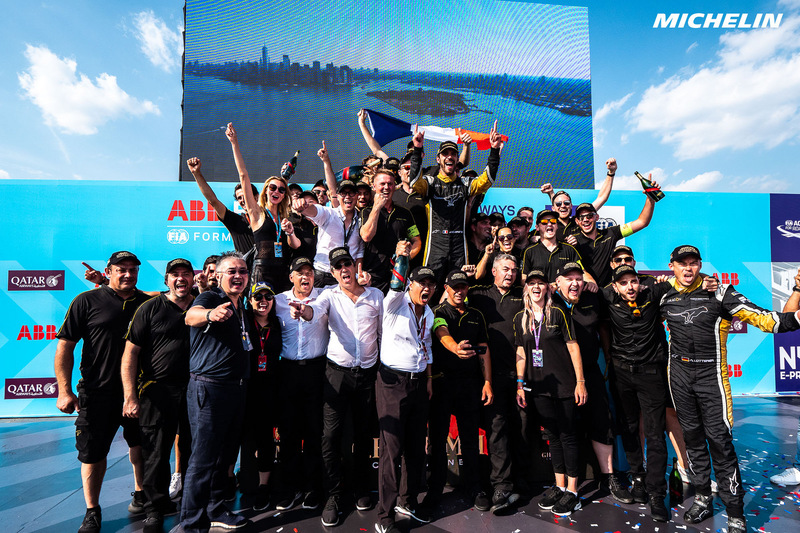 But now the Techeetah train was in motion, it was not to be denied and just a few laps later Andre Lotterer flashed past Bird, first job done, pushing Vergne's sole rival down the order and into the last points position. Although their race was going well for the driver's championship, up at the front their team rival was maxing out the points and putting their team lead at risk with the pit stops fast approaching. Given the length of the race, 45 laps, it was a mad dive that pretty much saw the entire field in on lap 22. Given the pitboxes face each other with a corridor down the center it was remarkable that most of the drivers made it through unscathed. Except Felix Rosenqvist, who got jammed up when Mahindra released Heidfeld into his path, causing him to veer and then get caught without enough steering to make his own garage. The other major casualty was Nelson Piquet Jr.'s Jaguar, which pulled quietly over on pit exit where it attracted the attention of local yellows, at least until it was cleared. With Vergne up to P6 he was within a spot of clinching the championship on the road, when Lucas di Grassi, who had been right behind his teammate, suddenly gave him a tap from behind and rocked past him on lap 24, squeezing him mercilessly to maintain his position as they hit turn 11. Watching this unfold very nearly gave Allan McNish a coronary and he could clearly be seen shouting something that looked like "make them stop" possibly with a few modifiers left out to keep this safe for work. Lap 29 was when Vergne officially took P5 and the unassailable championship lead and by lap 34 Bird was visibly slowing, his lap times dropping as the efficiency and regeneration just wasn't there for him when he needed it most. Just as Maro Engel had passed him his teammate lost the rear end into the high speed turn 5, swapping ends and utterly demolishing not only the back of his car but a big chunk of the TecPro as well. Out came the safety car and it looked to be a race to recover the stricken Virgin before time ran out on the race. When the race restarted, given how long had already elapsed (the race was basically on the limit in terms of maximum time allowed) it wasn't laps but the clock that was started, with Bird back in the points and the gaps gone. The other benefit of the Safety Car was it removed all need to manage energy and it was a sprint as the i8 wheeled into the pitlane and racing resumed. First Engel, then Bird managed to pass Prost on the 40th lap and then it was Bird, agonisingly trying to overtake Engel for the position that would extend the championship another day. AS they approached the final turn it all looked to be over but as it turned out di Grassi had managed to hit the finish line just ahead of the clock running out, giving Bird one more lap to get the job done. Valiantly he did all he could, getting close enough out of the dogleg complex to raise his team's hopes, but at the end of the day there just wasn't quite enough performance and the lengthy straights were simply never going to be the friend of any car running 13 kilograms overweight. Across the line then came di Grassi for the checquers, then Abt, Buemi and Dillman, who had hung in for a remarkable P4 crossed the line and then it was Vergne, his long stint in the wilderness finally over, taking the championship home for Techeetah, the customer team, a remarkable feat indeed, given the limited testing available to them. Speaking after the race, Andre Lotterer, confirmed that it was very much down to the development from the engineers, along with a tremendous amount of work in a simulator that he described as "one of the best". He also confirmed that it was strategy from the start for him to get in front of Bird as rapidly as possible, a task made easier by the relatively poor performance from Virgin's powertrain today. Also a first is the driver's championship being decided before the season is over, as in the previous years it has always gone to the last race. Fortunately, the constructor's title is well in play with Audi having made significant inroads into Techeetah's lead, with just 5 points separating the two teams going into tomorrow's finale. Renault made strides as well with a good finish, moving them up to P5 and just 6 points off Mahindra who did not have the smoothest of races today.